Stamford Notes: Three Cheers for Beers! As regular readers will know, I’m a fan of events that (1) support a good cause and (2) let you raise a glass of something tasty to do the trick! 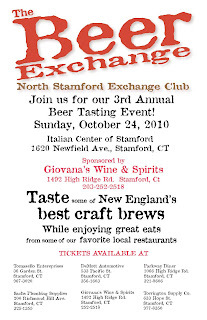 The North Stamford Exchange Club is putting together just such an afternoon, and they are calling it the Beer Exchange. 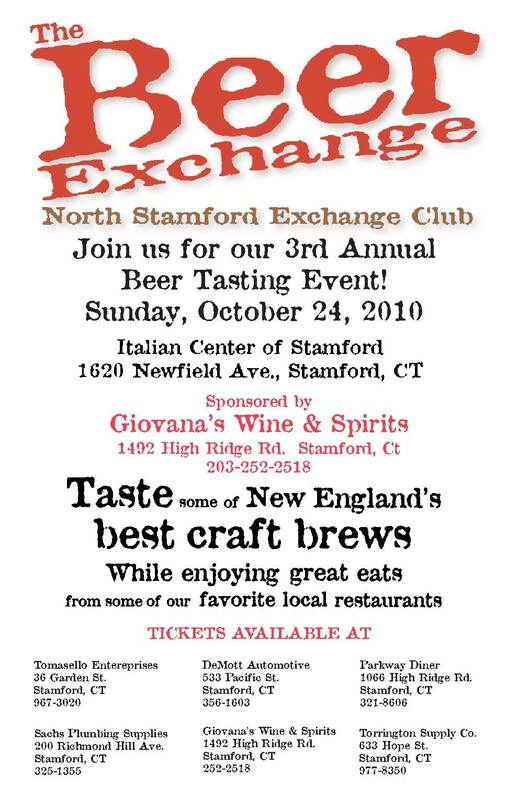 On Sunday, October 24th from 1-4pm, join them at the Italian Center (1620 Newfield Ave in Stamford) to sample some of New England’s frothiest native brews. Local restaurants will be on hand to keep you fed and a silent auction of sports-related goodies plus a drawing will keep you entertained. Proceeds from the event support all the good stuff the organization is doing. The biggest benefactor will be the Exchange Club Parenting Skills Center of Stamford (devoted to the prevention of child abuse). Football fans, there will be a big screen TV ready to roll so you won’t miss a minute. For more info, double click on the image of their poster or contact Amy Wilmot at 203-332-3788 or amywilmot@optonline.net.